You are here: Home / Career / Technology free retreat – What a great day! 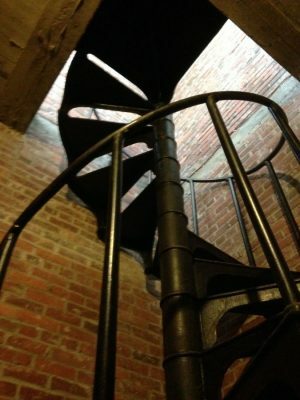 My retreat was at a local liberal arts college in a remote room in the chapel tower. 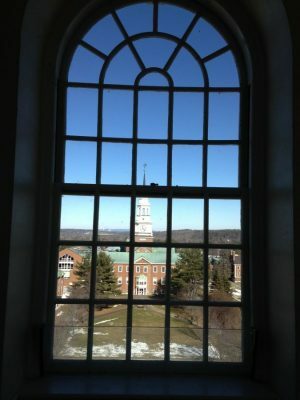 My view included the beautiful campus on top of Mayflower Hill in central Maine, to the east towards the coastal mountain range, and to the north up the Kennebec River Valley towards Quebec. Inspirational and fortuitous says my brother the priest. Below are some of my thoughts from that day. I find myself reaching for my phone to check emails (I must have 20-30 by now from last night) or to send a text to someone… and I realize…the text can wait, it really is not that important they receive this text at 8:45 a.m.
What did I do all day without email, computer(s), calculators? Well for one, I reviewed my QuickBooks reports and used long-handed division to determine my percentages for my five streams of income. That was fun. I wrote, uninterrupted. I planned. I studied my business plan. Read a NCDA journal that has been sitting on my desk for a month…and I thought. The value of slowing down and not chasing the busy-ness of life for a day was amazing. It made me think about a line from a blues band, “slow down you are too far in front of yourself”. (Ghost Town Blues band). I think too many of us let the busy-ness of life determine how our days unfold, and I believe we need to gain control over that aspect of our lives. No technology for the day and nothing terrible happened to me other than starting my day sweeping up 1000’s of dead house flies that come to this empty unused room in the chapel. The custodian of this building is afraid to come up here 🙂 obviously. When was the last time you actually started your day by stopping and listening to the wind in the trees and the birds singing in the morning? When was the last time you turned off ALL forms of communication and just thought about what’s going on in your life? When was the last time you wrote with a pencil in hand on lined paper trying to capture your thoughts about what is going on in your life? Take a day or a half day and turn off the technology, slow down, T H I N K, write and be mindful of all that is around you. and on this day, I embraced all of them.